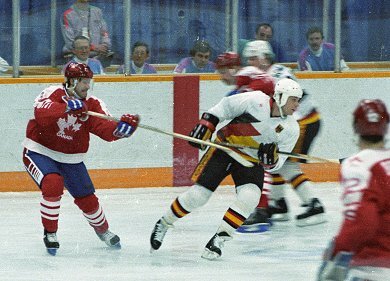 CANADA and WEST GERMANY compete at the 1988 Winter Olympic Games in Calgary. Altogether, one quarter of coach XAVER UNSINN’s West Germany’s ice hockey team at the 1988 Winter Olympic Games held at Calgary were native-born Canadians — goaltender KARL FRIESEN, defensemen RON FISCHER and HAROLD KREIS in addition to forwards ROY ROEDGER and MANFRED WOLF. Fischer and Friesen, both indigenous to western Canada (along with the East German-born UDO KIESSLING) became the first players with National Hockey League experience to fashion the sweater of the Federal Republic of Germany at the Olympics, as well. Ironically enough, for the first tournament open to professionals past or present at Calgary, the player with the most NHL games played at that point in time — former New Jersey Devils defenseman ULI HIEMER of EG Dusseldorf — was passed on by Unsinn and the West German national team. In the late 1970s, coach HEINZ WEISENBACH of Bundesliga club ERC Mannheim, promoted from the second division in 1976, began a program in earnest to recruit Canadian-trained players who could compete in the West German elite league as ‘native’ skaters. At that time, Bundesliga clubs were operating under strict limits on the number of foreign players. Kreis, Roedger and Wolf were three of the many Canucks brought in by Weisenbach to improve modest club Mannheim’s chances of survival in the top division. In 1978, the first ex-NHL skater was first given a West German national team sweater for a major international event. Former Atlanta Flames and Vancouver Canucks defenseman BOB MURRAY was deployed by West German national team coach HANS RAMPF for the IIHF World Championships in Prague that spring. The one-time Michigan Tech University rearguard would appear at three World Championships for West Germany but was always, of course, ineligible to play at the Winter Olympics.